03 July 2014 – iOS 7.1.2 is also supported. All iOS 7.1.X will be supported from now on. Great news! 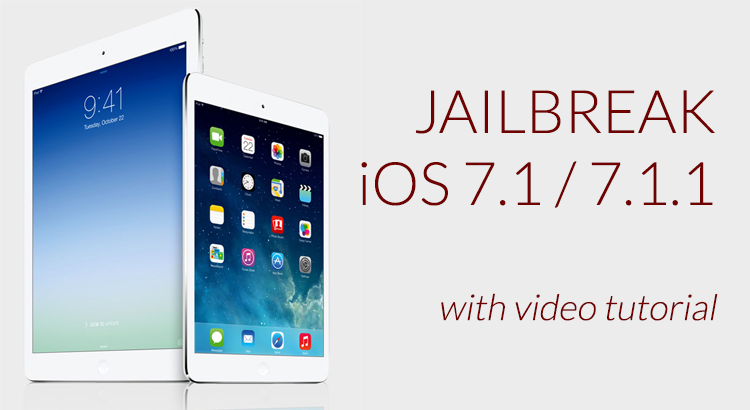 iOS 7.1 and iOS 7.1.1 now can be Jailbroken! As you may know, until couple of days ago, we used to be able to Jailbreak only iOS 7.0.6 or earlier iOS versions, but now a new tool called PanGu can Jailbreak iOS 7.1 or/and iOS 7.1.1! So How to Jailbreak iOS 7.1 and iOS 7.1.1? Jailbreak is a process to remove limitations on iOS, so by Jailbreaking you have more control on the Apple devices, and are allow to use any applications even if they are not accepted by Apple on their App Store! The latest supported iOS version for Jailbreak was iOS 7.0.6, and we could Jailbreak iOS 7.0.6 or earlier versions by using http://evasi0n.com, but how about the latest iOS versions such as iOS 7.1 or iOS 7.1.1 ? Can we Jailbreak iOS 7.1 and/or iOS 7.1.1 ? The answer is YES! We can! iOS 7.1 and iOS 7.1.1 now can be Jailbroken by using a tool named PanGu! iOS 7.1 and iOS 7.1.1 are now supported to be Jailbroken, and what is more surprise is that all devices are supported. So you can Jailbreak Apple iPad Air, iPad Mini, iPad Mini with Retina display, iPad 4, iPad 3, iPad 2, iPhone 5s, iPhone 5c, iPhone 5, iPhone 4s, iPhone 4, and iPod touch 5. Simply all devices that runs iOS 7.1 or 7.1.1 can be Jailbroken! As you may know our iPad Keylogger and all similar software require iOS device to be Jailbroken just because Apple would not approve such applications (see why). So to be able to use our software you must jailbreak the target device, but some of our customers had difficulties on Jailbreaking iOS 7.1 and iOS 7.1.1, just because these iOS versions were not supported until the latest Jailbreak tool was released. A Chinese development team named PanGu has released their tool that can Jailbreak iOS 7.1 and iOS 7.1.1. So now you can use our iPad Keylogger on iPads that run iOS 7.1 and iOS 7.1.1 too. For non-Chinese speakers, it might seem confusing but this video will help you how to Jailbreak iOS 7.1 and iOS 7.1.1. Spying an iPad is easy and simple with iPad Keylogger. All you need to do is to get our licence, and install the software on target iPad. Once the software is installed, you will start seeing all the activities by log in to your special web account on any computer you want. Please visit our homepage for all details; http://ipadkeylogger.com Our software is completely undetectable and there is no way for target users to know that they are being tracked.